Two female members of the Russian team at the World Athletics Championships have used their gold medal win as a platform for protesting their country’s anti-gay legislation, by sharing a kiss on the podium. Kseniya Ryzhova and Tatyana Firova won gold in the 4×400 metres relay at the Championships in Moscow today, along with teammates Gushchina Yulia and Antonina Krivoshapka. 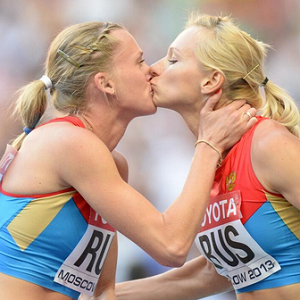 Ryzhova and Firova then kissed each other on the lips while on the winner’s podium. While more accepted as a sign of friendship in Russia than in other parts of the world, the gesture has been interpreted as a protest against anti-LGBT legislation in Russia due to the current frenzy around the issue. Swedish high jumper Emma Green-Tregaro, 28, also made a show of support for Russia’s LGBT community on Thursday by painting her nails in the rainbow colours for the qualifying round of the event. She was later told by the International Association of Athletics Federations that she may be in violation of their code, and changed her nails to red “for love”. Yesterday Russia’s pole vault champion Yelena Isinbayeva said comments she made about Ms Green-Tregaro, whom she said was being “disrespectful to our country”, were misunderstood. Ms Isinbayeva, an ambassador for next year’s Winter Olympics to be staged in Sochi, said: “It’s disrespectful to our country, disrespectful to our citizens because we are Russians. After calls were made for her to be stripped of her ambassadorship she claimed she had been misunderstood, but did not apologise for the comments. Also at Moscow, US track and field star Nick Symmonds, who earlier this week dedicated a silver medal to gay and lesbian people, spoke out against Russian anti-gay laws, saying they have started the “defining civil rights movement of our time”. On Monday, the Russian Interior Ministry confirmed that recently introduced anti-gay legislation will remain in force during the Sochi games. In the UK, Stephen Fry met with David Cameron and Evgeny Lebedev on Monday to discuss views on boycotting the Sochi games in protest.